We open with a grave narrator describing a broad social problem. Black culture reached its peak in the 1970s – funk music caught America by storm and Blaxploitation flicks were all the rage. Since then, it’s been going downhill, as footage of Mr. T and Urkel decisively prove. And so, in response to this emergency, a new, old, hero is needed: Undercover Brother. Undercover Brother (Eddie Griffin) is a movie superhero, an avenging angel, a “Soul Train reject with a Robin Hood complex,” as one of his friends puts it. His Cadillac convertible is gold and shiny, his lapels are dwarfed only by his proud ‘fro, and his clothes are loud and leather. U.B. works alone to right the wrongs of the world. But for those who prefer structure, there is the B.R.O.T.H.E.R.H.O.O.D., the organization dedicated to fighting the villainy of The Man. When General Bowtwell (Billy Dee Williams playing Colin Powell, essentially) decides not to run for president, and instead opens a chain of fried chicken restaurants, the B.R.O.T.H.E.R.H.O.O.D. suspects foul play. They recruit Undercover Brother to go undercover and find out if and how The Man is involved in this diabolical scheme. The plot is goofy. The characters are goofy (they are named Smart Brother, Conspiracy Brother, White She-Devil). The costumes are goofy. 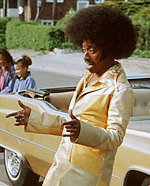 It’s impossible to take Undercover Brother seriously. And yet, the movie is not a complete waste of time. There is a lot of comic talent on-screen. There are laughs throughout, and the jokes are mostly about race and culture. These days, it seems only African-Americans get to make jokes about race — a point Chris Rock illustrated in Down to Earth. And yet, it’s probably for the best that someone can make these jokes, regardless of who it is. If we can all laugh at our differences, maybe that’s a hopeful sign for the future. Griffin, director Malcolm D. Lee (Spike’s cousin), and screenwriter Michael McCullers are careful to poke fun at both black and white equally, and thankfully, you can’t tell the good from the bad by the color of their skin. For example, White She-Devil turns out not to be such a bad person after all. Neil Patrick Harris gets an internship with the B.R.O.T.H.E.R.H.O.O.D. (affirmative action). And even the head-honcho henchman of The Man, played by Chris Kattan, has enough soul to cause his downfall. I admit it. I am influenced by the crowd, particularly at comedies. Undercover Brother screened with a big audience that was ready to laugh, and so it gets a mild recommendation. If I were at an uncrowded matinee or watching it on video, it probably wouldn’t have been nearly as funny, although I doubt I would have hated it. Undercover Brother is a product of the times. It’s not particularly good, but it’s good enough for a comedy.